If you're in the market for a Mercedes-Benz E-Class or something similar, then the Audi A6 has to be considered. It runs the Merc very close indeed for sheer quality and refinement, while the styling is subtle enough not to shout about the car's status. A fine and desirable executive model. Want executive transport with a dose of subtlety? That'll be the Audi A6. It's handsome and understated but also exceptionally well built and is really comfortable. The cachet of the four rings on its big grille mean the Audi hangs onto its value better than most rivals but it's also practical, with a tremendously spacious interior. A more than worthy rival for the Mercedes-Benz E-Class. You've a choice of 2.0-litre FSI petrol and TDI diesel models at the bottom end of the scale. Ride up the spec list a bit and larger V6 engines come into play in the form of 2.7-, 2.8-, 3.0- and 3.2-litre units and seriously powerful 4.2-litre V8s occupy the upper echelons on the range, though they're incredibly rare in Ireland. Standard trim models are best avoided at this level as they're difficult to sell on later down the line, but anything from SE upwards is generally a safe bet. After that you have Sport and S Line, both of which add extra kit. Limited Edition models are also worth keeping an eye out for, as are the post-facelift models from 2008 on. 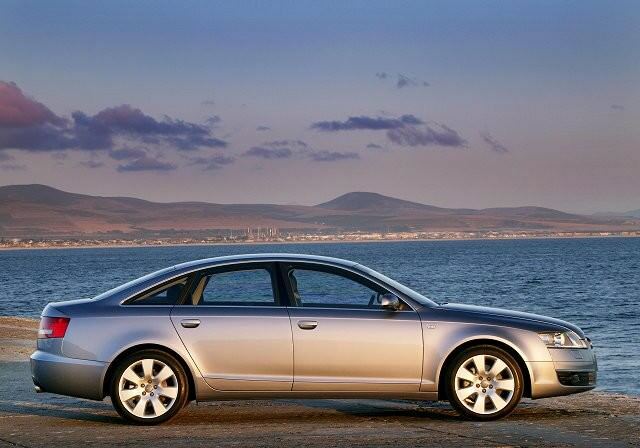 Aside from a four-door saloon, the A6 is also available as an estate, called the Avant. Expect all the usual mod cons along with a simply enormous boot. This version was also turned into a soft roader with jacked up suspension and black plastic cladding on the exterior known as the allroad quattro. This four-wheel drive model was only sold in Ireland with V6 engines and adaptive air suspension as standard. At the top of the scale are the seriously high-performance S6 and RS6 models. They're ultra-rare and expensive to run. As we mentioned, lower specified versions of an executive model like the A6 are best avoided because of potential resale pains. Go for an SE or anything higher up the food chain and you can't go far wrong, though. The V6 TDI versions aren't the cleanest or most frugal diesels around, but they complement the A6's smooth and easy nature beautifully. That said, we would recommend the 2.0-litre TDI over anything else because it does the job almost as well and drives down running costs.